One of the distinctive contributions of Irish Protestants to New Zealand was the Orange Lodge. It was first established in New Zealand in 1858 and spread through the country in the 1870s. 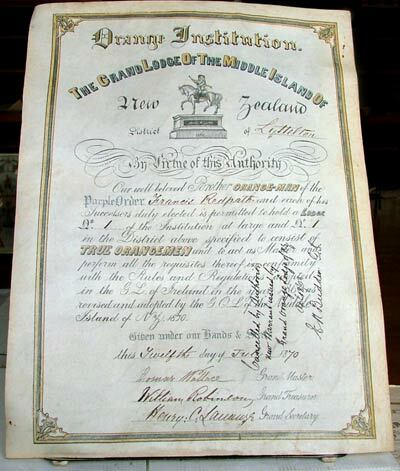 This certificate is the order establishing the Lyttelton lodge in 1870. The Orange Lodge was named after William of Orange, the Protestant King, who defeated the Catholic King James II in 1890. An image of King ‘Billy’ on his horse can be seen on the certificate.